« Commemorate Hanukkah at Your Holiday Party with Edible Dreidels! Great Gift Giving Idea Too! 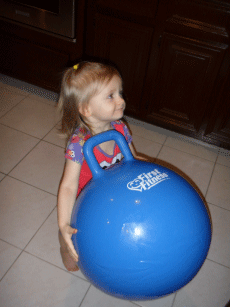 Aqua Leisure is a company that has such a wide variety of family-oriented and kid-friendly products that when they offered me the chance to review the First Fitness 18-Inch Hop Ball, I just couldn't say no. Keep reading to find out more about this fun exercise toy. 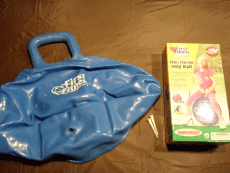 I reviewed the First Fitness 18-Inch Hop Ball from Aqua Leisure, which retails for $13.95. 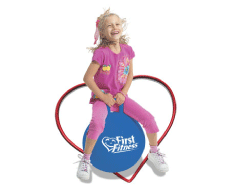 The First Fitness 18-Inch Hop Ball from Aqua Leisure is a toy geared to increase children's flexibility and cardio, while they also build leg strength and balance as they bounce. Of course, this toy is also a lot of fun! 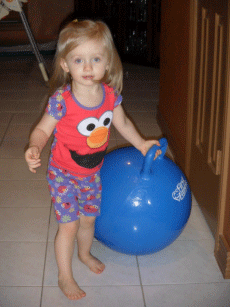 What child wouldn't enjoy bouncing all around the house or yard on a large rubber ball? It's also extremely easy to play with, so that your child won't get discouraged and quit using it. 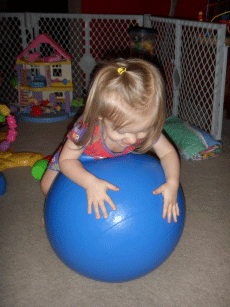 Simply climb aboard the ball, put the large, square, flexible handle between your legs and get to bouncing! The Hop Ball has a recessed inflation valve for safety and comes complete with two large plastic plugs for the valve; one to use and one for a spare. I had this toy up and running in a matter of minutes, since I inflated it using an electric air pump we already had for a blowup mattress. 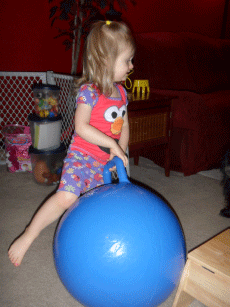 The First Fitness 18-Inch Hop Ball is meant to be used by children ages 4 and up, weighing under 80 pounds. Since Riley is about to turn 2 on Sunday, she was a little too small to use the Hop Ball as it was intended. That didn't stop her though from having a blast playing with it! She picked it up by the handle and threw it, rolled on top of it, tried riding it as intended, and just carried it around. After seeing Riley interact with this toy, even though she was much too young for it, I am convinced that this is an all-around fun toy for children of any age! If you want to encourage physical activity and exercise with your children, then I highly suggest the First Fitness 18-Inch Hop Ball from Aqua Leisure. Your child will get a tremendous workout, increase their strength and agility and have tons of fun all the while. This is a high-quality toy that is very easy to both inflate and deflate, and also extremely easy to operate and play with. Since the Hop Ball also has a price tag of only $13.95, how can you go wrong? With the physical fitness and health of America's children on the steady decline, I think this toy is an essential stocking stuffer for the holidays! 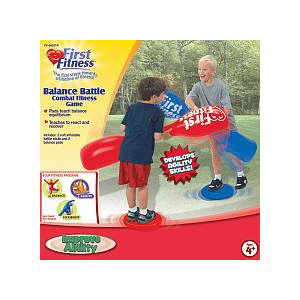 Aqua Leisure was generous enough to give my readers the chance to win one of their most popular items...the First Fitness Balance Battle Combat Fitness Game! Just think, now your children can get fit, rid themselves of pent up energy and frustration, and have a great time, all in the process! Disclosure: I received the First Fitness 18-Inch Hop Ball from Aqua Leisure in order to facilitate my review. No other compensation was received. This product review is based on my own personal experiences with this item and is completely honest and objective.